A time for giving and receiving. A time for celebration. A holiday I’ve only read about in a storybook – page after page of seeing a little girl celebrating the joys of Christmas. I had envied that girl, reading her tale on the cold, library floor while she was surrounded by so much warmth. So many cycles trapped in the facility by my Owner, my only presents the old, tattered books that surrounded me, my imagination my only salvation. So many cycles, I’d spent wishing to be like the girl in the fairy tale, wishing I was surrounded by my loved ones, opening presents and enjoying their company. My wish had finally come true. This cycle would be different. Rescued by my star knights, I vowed to enjoy every minute of this season with them by my side. This Christmas, I would enjoy being free. 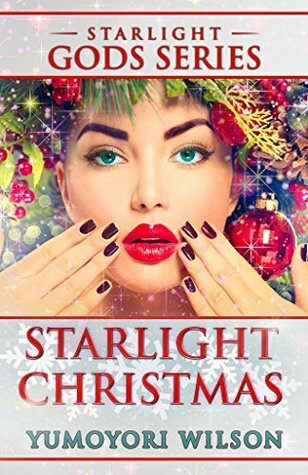 Starlight Christmas is apart of the Holiday Series. It will be FULL-LENGTH novel and does not take place during the same timeline as the main series. It’s recommended to read DARK WISH- BOOK ONE of the Starlight Gods Series to understand/enjoy this novel. Recommended for 18+ audience, containing mature sexual content and strong language. Marcus turned his attention back to me – a satisfied grin formed on his smooth lips. I finally realized what he just did. “I’m prepared for that.” He reassured me. I was about to stand up when one arm hooked around me and his other arm hooked underneath my knees, lifting me up with ease. I quickly hooked my hands around his neck as I gave him a confused look. He buried his face against my shoulder – kissing my flesh. I moaned, biting my lip. He rose to kiss me on my lips before pulling away. Yumoyori Wilson is from Toronto, Ontario. She loves to sleep and write her days away. She works at night as a registered nurse. She has a little addiction to bubble tea and coffee but loves to workout. She has big plans for the writing world and can’t wait to share them with everyone. I just love her hair!